Ms. Olivia Marie Braida-Chiusano (artist pen name OM Braida) is an art instructor and art curriculum developer, botanical illustrator, and professional artist with works in four museums and both private and public spaces throughout the United States, Europe, and the Caribbean. She has over 20 years’ experience teaching students in person and also through her at-home study courses. 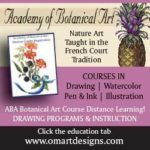 Her Academy of Botanical Art provides a full-service distance-learning art school, with complete guidance and tutoring. The author of “Ten Steps – A Course in Botanical Art & Illustration – Volumes 1-12” is a step-by-step art and science program that leads your child through process to completion. It’s easy to follow format can be used as a basic art program, as well, with inter-changeable art tasks. architecture to name only a few! Development of creativity and artistic vision. Guidance for Portfolio presentation for college application/acceptance even if your child applies to a non-art program! Olivia originally designed the program for use at the Ringling College of Art & Design a top 5% design school in the country according to College Factual that ranks according to nationwide colleges and university statistics. Their graduates are highly sought after by Pixar and Disney. So, her program had to be top drawer. She has had a 14-year-old student who completed the program and graduated with developed skill in botanical art and received a number of scholarships. When she applied to a high-ranking college, the Admissions Committee was amazed that one so young could create such a portfolio as hers. Her college degree lead her to New York as a graphic illustrator, then department manager, and now the owner of her own graphics design studio. Olivia has noted that as students work through her program they become courageous and fearless, experiencing other positive emotional and intellectual changes . . . far beyond simply learning art. Parents who want these developmental changes for their children are quick to see the value in Olivia’s course. Olivia feels that the parents’ job is to put her books in front of the child, help him/her to develop discipline and encourage the child as a person – not to critique the art. Further, Olivia notes that High School teens with interest in art and science can use the results from even one or more semesters of these art courses to gain school credits, and possibly college credits. Younger students who begin early, way before they can drive, have boyfriend/girlfriend relationships and Life becomes too busy, have more time to create a valuable portfolio that has the potential to win them acknowledgement, scholarships, and college entrance. Included in Olivia’s curriculum package (or sold separately) is the The Perplexi®, a modern drawing tool reinvention of hers based on the 15th Century Alberti’s Veil that is a visual grid aid to understanding and drawing dimensional concepts like foreshortening, perspective, and proportion. It is a 12” square sheet of Plexiglas® and 4 sheets of grids – 2 paper, 2 plastic. Finally, Olivia’s program is a very detail-oriented one and she opines that it might be good for those with PTSD, because the student has to focus and look and be still to complete fine tonal drawings and detailed watercolor paintings. Course credits vary by state for middle school, high school or college credit, so check your institution for transferability.